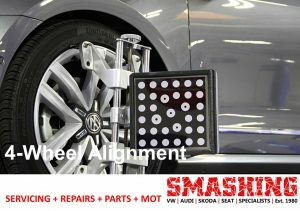 Wheel alignment, sometimes referred to as tracking, is part of standard vehicle maintenance that consists of adjusting the angles of wheels to the VAG manufacturer specifications. The purpose of these adjustments is to reduce tire wear, and to ensure that vehicle travel is straight and true (without “pulling” to one side). An increasing number of Volkswagens and Audi have advanced driver assistance systems (ADAS) such as electronic stability control, anti-lock brakes, lane departure warning, adaptive cruise control and traction control. These systems can be affected by mechanical alignment adjustments. This has led many manufacturers to require electronic resets for these systems after a mechanical alignment is performed.